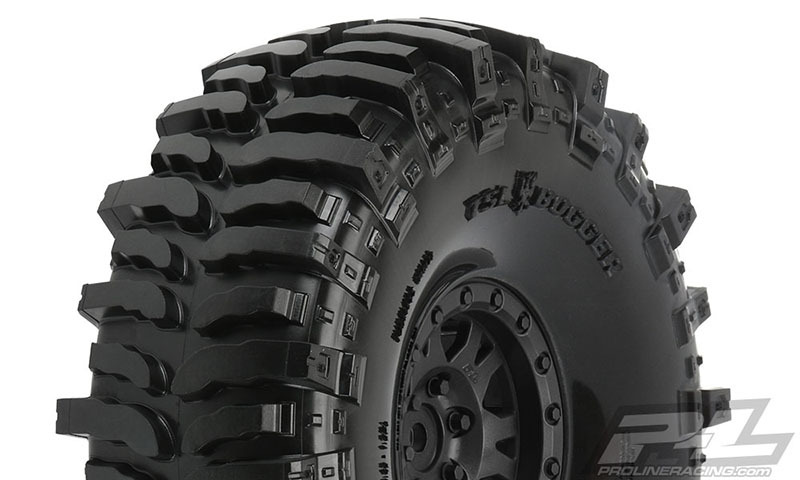 This is a pair of pre-mounted Interco Bogger 1.9" Tires. These massive 5.4" tall x 1.91" wide tires are perfect for guys looking to do some Mud Bogging with their rigs or for recreating a beloved full size truck in perfect scale detail. Pro-Line's officially licensed Interco® Bogger® tires feature a directional tread pattern with the patented Interco TSL (three stage lug) design just like the full-size tires. The new Bogger® tires are aggressive in stock form and are also extremely versatile and easily modified for even more mud flinging performance. They come in Pro-Line's legendary G8 compound, so you know they will perform beyond expectations right out of the package. The Interco Bogger 1.9" tire comes conveniently pre-mounted to Impulse Black Plastic 1.9" wheels that are Proudly Made in the USA! These all-new Impulse wheels are designed to not only look scale but to be super easy to use by only requiring 6 screws per wheel for mounting tires. The unique 3-piece plastic wheel design bolts together in the back and locks on to Pro-Line's incredible list of 1.9" Crawling Tires. The back of this 12mm hex Rock Crawling 1.9" wheel also accepts Pro-Line's Brass Brake Rotor Weights (sold separately) for additional looks and performance. The overall wheel width and wheel offset are the same as Pro-Line's line of 1.9" Aluminum Pro-Forge Wheels, so you know they will fit your truck and look good doing it. Be the first on your block to get the Interco Bogger 1.9" tires mounted to Pro-Line's new 1.9" Black Impulse wheels - Order yours today!